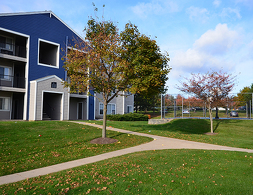 Off-Campus Apartments Near Penn State University Tremont Student Living features a convenient location to Penn State University amid the beauty of the Pennsylvania hills. Students can turn one way and see the beautiful scenery of State College, PA, or go the other way for class at Penn State. Any way you turn from Tremont, you’ll get a taste of Pennsylvania pride. At Tremont, updated features give students a community where they’ll feel at home, and amenities support both their studies and social activities. Spend an afternoon playing sand volleyball or barbecuing with friends, or buckle down and study in our business center. Displaying 1 through 1 of 1 results. Apply now to save $134!